This is a story of two embers lit in the Western Hemisphere—two embers that flamed in Australia and spawned three generations of scholars at The University of Queensland. Every day, five members of one household centre their lives on the campus at St Lucia—doctoral, post graduate and undergraduate. It is 2016. The metaphor of education as the spark and flame of life begins in the Ottoman Empire of the late 19th century and glows now in Queensland through the grandchildren of Joan (Ioanna) Lambrides (B. Arts, 1981). This story has Greek roots in both language and genetics. This university has evolved in the traditions of the western civilization and now is much, much more as a leading university in Australia. Θεωρίας εἵνεκεν εκδημείν. ‘To go abroad for the purpose of seeing the world’ is the inherited meaning of this Ancient Greek phrase, but in this story the journey is one of survival, migration, advancement, achievement and love. Joan Eleftheriou met George Lambrides LL B Athens, 1939 as a young woman in Nazi-occupied Athens – the strands of the story come together. 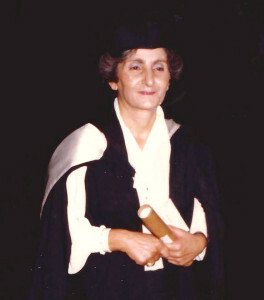 Joan, born in Melbourne in 1929 to a Greek father from Asia Minor and an Australian-born mother of Greek descent, had been sent to Athens with her mother and three sisters to get ‘a Greek education’. She was eight. In Greece, she was an Australian child with a thirst for learning; she studied Greek, English and French at primary and early high school. War and famine wreaked havoc on the community and this family, but Joan found a way to escape this ugliness by reading any books of any language she could get her hands on, by the light of a candle. Was this thirst for knowledge an inherited trait or a mechanism of survival? Nature or nurture? Her own father Homer was a simple man with no education, the son of a farmer from Alatsata, Asia Minor (Alaçatı, Turkey). He was given four Turkish gold coins, put on a ship to avoid the turbulent times and military service, and was sent off to make a life on his own in Australia at the age of 14. He arrived in Melbourne in 1910. He knew the benefit of education because his highly educated eldest brother had risen to the highest ranks of the Eastern Orthodox Church in Constantinople and was appointed Grand Chancellor (today CEO) in 1912, but for Homer there was no thirst or time for learning. George Lambrides was a handsome young lawyer when Joan met him in Athens as a 14-year-old. She was attracted to his ‘brain’, of course, and struck up a respectable correspondence with him that continued after the war separated them and she was back home safely in Australia. He escaped the civil war in Greece after WWII by working in Africa and eventually proposed to Joan by letter in 1950. There was no future in Greece for a lawyer, the refugee son of a refugee businessman twice displaced from their birth place in Kuşadası, Turkey; 1922 was a horrible year for Asia Minor Greeks, but was the beginning of new nationalism in Turkey, throwing off the shackles of the Ottoman Empire. His attraction to Joan and a chance to start a third life in Australia brought George to Melbourne in 1950. It was a hard road for a man of foreign letters and foreign law. He never practiced law in Australia. The proud parents of three boys sacrificed all and worked hard, with the goal of educating their children. All three boys graduated from the University of Queensland:Gary Charalambos B. Pharm (Hons), 1974; Homer Stephen, B. Com 1975, LL B 1978; and Christopher John, PhD 1996, B. Agr Sc, 1981. I am not sure whether this should be as I am 47 years of age and do not have a senior pass! But to me it is as if I am reaching for the ‘impossible dream’ to be able to do an Arts course at the University. I just could not do justice with any words of the desire I have had to be able to continue studying at that particular level. Being caught between two worlds, a war, and personal investments, has gradually taken this need of mine further and further away. Joan fanned these embers, lit the flame for herself and the tradition is now carried on by her five grandchildren, three of whom continue their studies at UQ. All will benefit from the gift of education. Joan Lambrides B. Arts 1981. Story submitted by Gary Charalambos Lambrides B. Pharm (Hons), 1974. [i] ‘To me it is as if I am reaching for the impossible dream’ by Adrian McGregor, The National Times, Feb 7-12, 1977, p3. [ii] Θεωρία = Theory, as opposed to practice, and so, generally, science. Θεωρίας εἵνεκεν εκδημείν = To go abroad for the purpose of seeing the world. This entry was posted in Family and tagged 1980s, Family, Mature-age, Θεωρία. Bookmark the permalink.